At only 175 miles from tip to tip, Prince Edward Island (PEI) may be the smallest Canadian province, but what it lacks in size it makes up for in charm. The island boasts a beautiful landscape, exciting outdoor activities, succulent fresh seafood, lively music, and friendly islanders. Despite all of these incredible attributes, tourism in PEI is very much tied to literary character Anne of Green Gables. 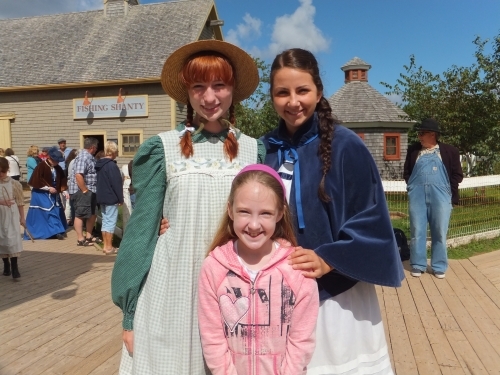 Here are my tips for discovering the magic of Anne of Green Gables on Prince Edward Island. Lucy Maud Montgomery’s most popular novel was first published in 1908 and her spunky orphan was soon captivating readers around the world. The novel’s popularity endures more than 100 years later and, according to the Tourism PEI website, millions of fans have journeyed to the island to experience the magic for themselves. The character’s presence is felt most strongly in the Cavendish resort area, known as Anne’s Land, as this is where the author once lived and where her stories are set. Besides the attractions that are connected to either the author or the character, visitors will also find Anne souvenirs in nearly every shop they enter and will likely stay in accommodations bearing names taken from the pages of Montgomery’s novels. Over the years, we have visited nearly every Anne site in the area and can recommend our four favorite activities for families wanting to experience the magic of Anne on Prince Edward Island. 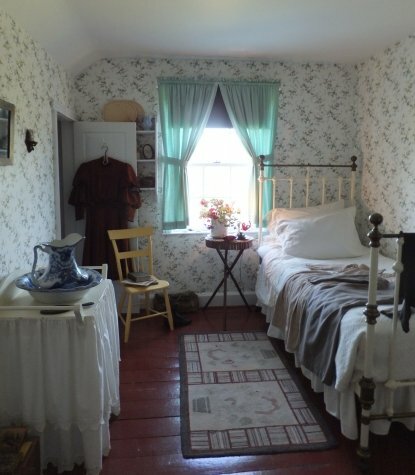 Green Gables Heritage Place is part of Lucy Maud Montgomery’s Cavendish National Historic Site operated by Parks Canada and is an absolute must for Anne fans. Visitors can tour the inside of the home that inspired Montgomery to write the novel and view rooms set up as they were described by the author, poke around the farm buildings to learn more about rural life in the early 20th century, stroll the Haunted Wood or Balsam Hollow trails, and of course, pose for a family photo outside Green Gables itself. Avonlea Village in Cavendish, based on the fictional village where Anne lived, is one of the most popular area attractions for families and, not surprisingly, has been one of my two daughters’ favorite activities since it first opened. Costumed characters from the novel roam the streets of the village interacting with visitors and acting out popular scenes. The Avonlea band entertains several times a day with 30-minute concerts featuring traditional music. Both children and adults can compete in games such as potato sack or egg and spoon races. The day’s activities wrap up with pig races — an event that simply must be seen to be believed. From the moment visitors arrive in the village, via the Bright River train station, they will feel like they have stepped into the world of Anne of Green Gables and should plan on spending the day to fully enjoy the slate of activities. Anne of Green Gables – The Musical has been playing in Charlottetown at The Confederation Centre of the Arts each summer since 1965. It’s a lively show with catchy tunes that capture the spirit of Anne. We first saw the show performed in 1999 when my older daughter, Katie, was just shy of 3 years old. It was her first time attending a musical and I credit it with igniting her passion for the theatre. 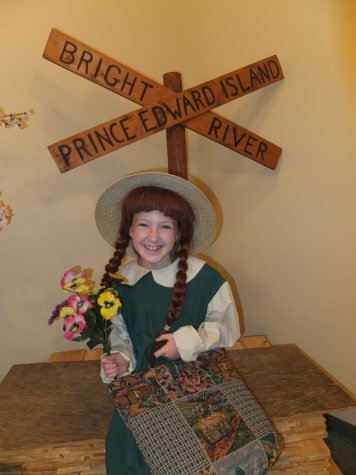 Now age 15, she has dreamed for years of someday playing Anne on the stage in Charlottetown and I have dreamed of sitting in the audience cheering her on. Cavendish Figurines in Gateway Village (near the Confederation Bridge) is the final Anne spot that we visit every time we are on the island. The company makes beautiful earthenware collectible Anne of Green Gables figurines but the big draw for us has always been the opportunity to dress like Anne. For a few dollars visitors can don a costume and take their own photos in the small studio. There are many photos on display providing ample evidence that visitors of all ages and gender enjoy this opportunity to play dress-up. 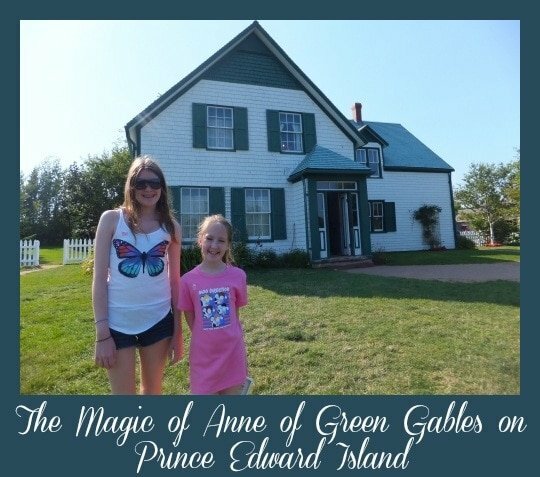 Although both of my daughters were much too young to have read Anne of Green Gables prior to their first visits to Prince Edward Island, visiting these sites made her a familiar part of their lives. As little girls they played with Anne rag-dolls and dressed up like her. Before long they were reading the stories themselves and falling in love with the magic of Anne—a character who oftentimes seems to be part of our family. Have you ever been inspired to travel someplace to see the setting of a favorite literary work? Let us know about your literary travels in the comments! 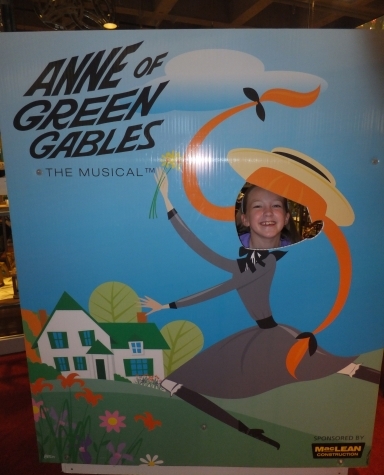 Our family visited PEI a few years ago–I have to admit Anne of Green Gables is what drew me there too. 🙂 It’s a beautiful little place! Orchard House in Concord, Massachusetts, is another great historical/literary spot. I had never heard of Anne of Green Gables but it sounds awesome…I bet my 7-year old daughter would love it! When I was a young girl Anne of Green Gables dresses were very popular in department stores. They were not sold as costumes but as a brand of nice dresses. Great photos, Lisa! I must put PEI on my list of literary destinations to visit. Looks a clean and delightful place. Lisa – I have to admit that I have never read any Anne of Green Gables stories. It all looks so charming, though, I think I will have to get one to read with my daughter! Michelle, I had to google Orchard House for the literary connection – I didn’t realize that was the Louisa May Alcott house. I love Little Women as well and have added that site to the places I’d love to visit! Phil, 7 is the perfect age to introduce Anne of Green Gables to your daughter. We had a “learn to read” version of the story that our girls read before they were old enough for the novel itself. Anne is a fabulous female character – she’s spunky and smart, she’s a loyal friend and she has a vivid imagination. Her stories are also a lot of fun to read as her habit of daydreaming leads to some hilarious mishaps. Ellen, there was a time when my daughters would have loved to have a fancy Anne of Green Gables style dress to wear. My older daughter had an Anne costume when she was 4 that she wore for Halloween and she thought that it was the best thing ever! Lesley, PEI is a wonderful place to visit with so much to do – Anne is just a small part of it – you would love it! Colleen, you should definitely read Anne of Green Gables! I didn’t read it until after we had visited PEI the first time and I loved it so much that I then read the entire series!